ਉਸ ਨੇ ਬਾਅਦ ਵਿਚ ਆਪਣੇ ਆਪ ਨੂੰ "ਕੈਥੋਲਿਕ ਧਰਮ ਤੋਂ ਬਚਣ ਵਾਲਾ" ਕਿਹਾ। ਵਾਟਸਨ ਨੇ ਕਿਹਾ, "ਮੇਰੇ ਲਈ ਸਭ ਤੋਂ ਖੂਬਸੂਰਤ ਗੱਲ ਇਹ ਸੀ ਕਿ ਮੇਰੇ ਪਿਤਾ ਜੀ ਰੱਬ ਵਿੱਚ ਵਿਸ਼ਵਾਸ ਨਹੀਂ ਕਰਦੇ ਸਨ।"
↑ "He may have unravelled DNA, but James Watson deserves to be shunned". December 1, 2014. ↑ "Fury at DNA pioneer's theory: Africans are less intelligent than". October 17, 2007. ↑ Crawford, Hayley. "Short Sharp Science:James Watson menaced by hoodies shouting 'racist!'". New Scientist. Retrieved April 24, 2014. ... he was "inherently gloomy about the prospect of Africa" because "all our social policies are based on the fact that their intelligence is the same as ours, whereas all the testing says not really. ↑ "James Watson, The Nobel Prize in Physiology or Medicine 1962". NobelPrize.org. 1964. Retrieved June 12, 2013. ↑ Watson, James. "James Watson (Oral History)". Web of Stories. Retrieved December 5, 2013. ↑ Cullen, Katherine E. (2006). Biology: the people behind the science. New York: Chelsea House. ISBN 0-8160-5461-4. 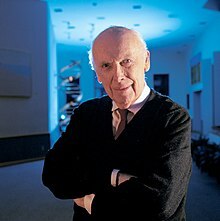 ↑ "Nobel laureate, Chicago native James Watson to receive University of Chicago. Alumni Medal June 2". The University of Chicago News Office. June 1, 2007. Retrieved November 20, 2007. ↑ Kitcher, Philip (1996). The Lives to Come: The Genetic Revolution and Human Possibilities. ↑ "Notable Signers". Humanism and Its Aspirations. American Humanist Association. Archived from the original on October 5, 2012. Retrieved October 4, 2012.